ON THIS DATE (August 11, 1998) ... The Red Sox weathered a 1-hour 25-minute rain delay and rallied to score a 7-4 victory in the 10th inning. After thunder and lightning rumbled overhead for much of the first eight innings, Nomar Garciaparra treated the diehard Sox fans among the Fenway Park crowd of 33,290 who refused to leave to a real thunderclap in the 10th with a three-run homer off Jeff Montgomery, the shortstop's second blast of the night. Nomar hit a solo shot in the sixth off Royals starter Tim Belcher to tie the game, 2-2. But it was his 10th-inning homer -- his 24th of the season -- that made a winner of reliever Tom Gordon, who allowed three hits and a run in 2 1/3 innings to improve to 6-3. Sox starter Steve Avery gave the Royals a 2-1 lead. But Garciaparra got Avery off the hook when he homered into the Sox bullpen in the bottom of the inning to tie it, 2-2. After twice battling back to tie, the Red Sox finally surged ahead in the seventh, 3-2, when Darren Bragg slid home on Orlando Merced's pinch-hit sacrifice fly to right. But the Royals came back with two outs in the eighth to push across the tying run when the skies finally parted at 9:33 after threatening all night. Royals' Hal Morris, who was shifted from left to first after the resumption of play, drove in the go-ahead run in the ninth, putting the Royals up. The Sox loaded the bases in the ninth against Montgomery on singles by O'Leary, Mike Stanley, and Bragg. However, they managed to push across only one run when Hatteberg hit into a 4-6-3 double play. Benjamin came to the plate with two outs and pinch runner Damon Buford at third but struck out to send the game into extra innings. 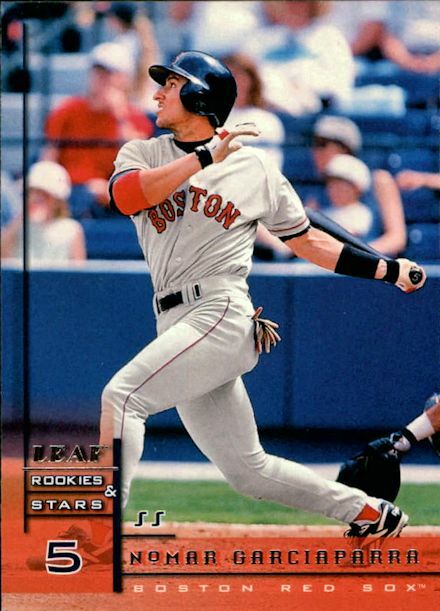 That's when Nomar's thunderous hit saved it from being a washout.